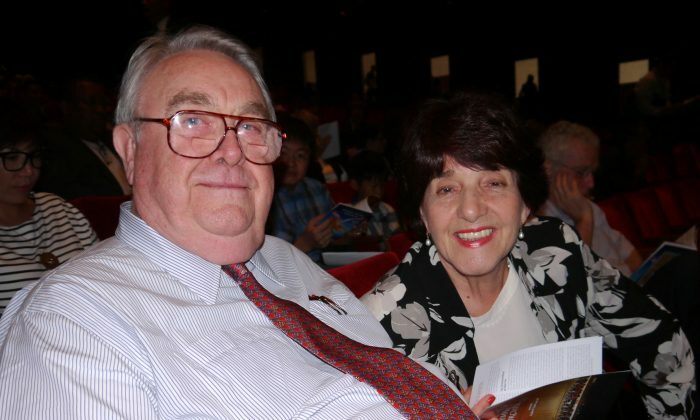 HOUSTON—Shen Yun Symphony Orchestra brought scenes of faraway places to fruition for Dr. Robert Battle. “I saw the majestic mountains, I climbed to the forest, and I saw a wonderful, wonderful feeling of beauty of nature,” Dr. Battle said at the Jones Hall for the Performing Arts in Houston Sunday afternoon. Shen Yun Symphony Orchestra blends East and West, mixing traditional Chinese instruments into a full Western symphony orchestra. A selection of original compositions are performed alongside classical pieces by Beethoven and Tchaikovsky. A number of the orchestra’s original compositions were first performed in Shen Yun Performing Arts, where they initially accompanied traditional Chinese dance. Dr. Battle, who opened his clinic, Comprehensive Health Center, in 1988, has served his community as a Rotarian, United Fund Director, and as a Director of the Texas Heart Association. He attended the performance with his wife Mrs. Cecilia Battle, a retired teacher. At intermission, Dr. Battle added that the three conductors, he had so far seen, were a joy, and he lauded Shen Yun’s “fresh pieces” of original music. Rick Hodge, a human resource director, attended Shen Yun Symphony Orchestra’s matinee performance at Jones Hall for the Performing Arts in Houston on Sunday, Oct. 13, 2013.